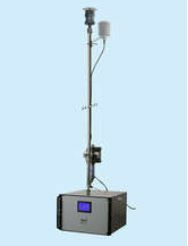 Ambient air particulate monitor to detect TSP, PM10 or PM2.5 in ambient air for use in industrial or governmental ambient air monitoring networks. The new scattered light dust monitor to detect lowest to medium dust concentrations in dry flue and process gas. The D-R 320 is based on the back-scattered light principle. Thereby the light of a red laser diode illuminates the dust particles in the measuring volume of the flue gas duct. The light scattered backward by these particles is detected and evaluated. A unique feature of the D-R 320 is the automatic background light compensation with means of a patented optical system with dual detector. This allows for an easy and quick Installation without any adjustment. A light trap is not required.